The topic of The Danger of a Single Story by Chimamanda Adichie in the Equity Unbound course suddenly seems everywhere in my field of vision. First, of course, the professors who are collaborating in the Equity Unbound (Mia, Maha and Catherine) have invited the open participants to view the TED talk on this topic. But then, at a meeting this week for the Western Massachusetts Writing Project, a colleague who teaches at a middle school was sharing with us one of his educational ideas to broaden cultural perspectives with his seventh graders, and he mentioned how that very day, he had been showing the TED talk with his students to spark writing and conversation. I nearly jumped out of my seat, to say, we’ve been talking about that, too, in Unbound Equity. I didn’t jump but I did talk to him later about the discussion threads unfolding online. Which all got me thinking about the unit I am in right now with my sixth graders, around short story writing. 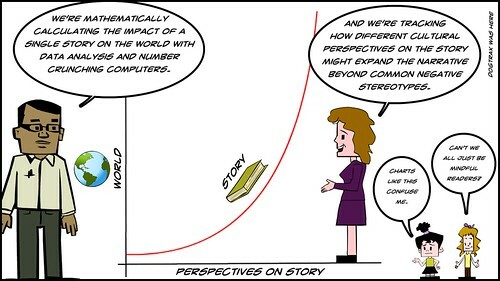 We’ve been exploring Narrative Point of View, and the choices a writer makes in telling a story, and how different Narrative Points of View (first person, second person, third person) bring to light different elements of story. Right now, my students are flipping a touchstone text story from the start of the year (Rikki Tikki Tavi) and re-writing the story from the view of what was the antagonist, turning her into the protagonist. 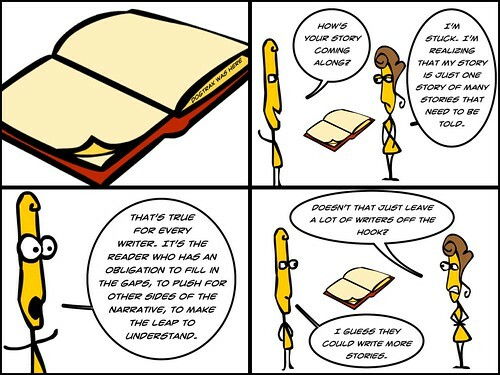 Some of my young writers are struggling with this shift in perspective — they get locked into a story as it is told (as if a writer can do no wrong) and can’t twist it another way. Others are excited about the freedom this shift gives a writer. A phrase I have tried to repeat to them: Every character is a hero in their own story. Everything is perspective. 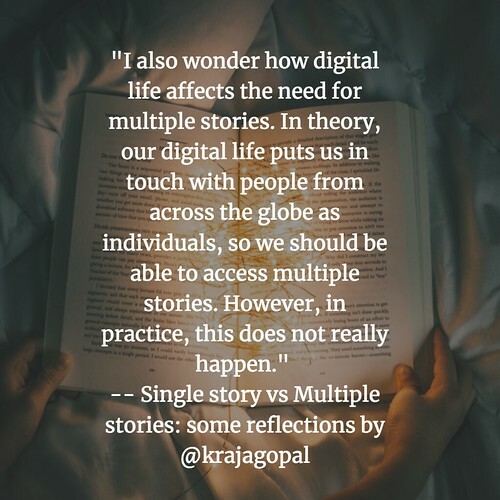 And all this discussion and conversation has me wondering if it is nearly time to consider bringing The Danger of a Single Story into my classroom, as an extension of our writing. I feel inspired by the work and insights of others in Equity Unbound and beyond. I need to watch it again myself, from the perspective of my young students, and consider the appropriateness for our learning space.